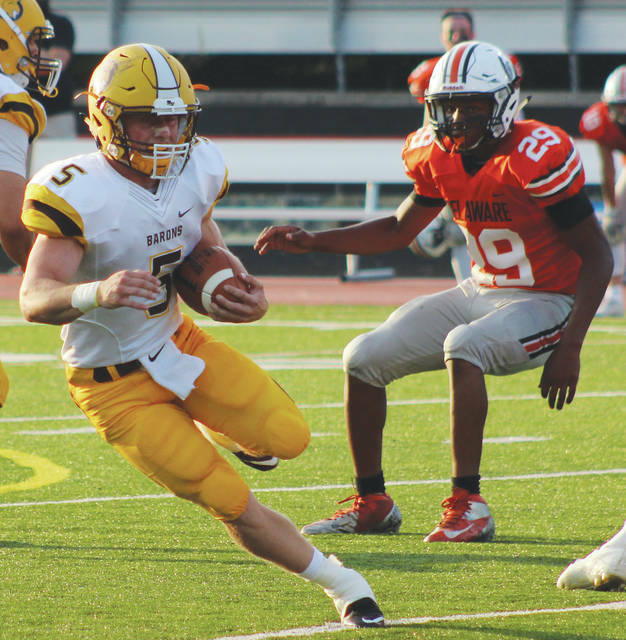 Buckeye Valley senior running back Trent Davies looks for running room during the 2017 season opener against rival Delaware Hayes. Davies, who rushed for a school record 1,619 yards to go with 18 touchdowns, is the 2017 Delaware All-County Offensive Player of the Year. Olentangy Orange senior linebacker Bryce Houston, who finished with 56 tackles (37 solo), 9.5 tackles for loss, three sacks, five pass breakups and an interception, is the Defensive Player of the Year while Pioneer coach Zebb Schroeder nabbed Coach of the Year honors. See page 12 for the complete rundown of the teams. BIG WALNUT – Luke Apple (Sr.), Nathan Lawyer (Jr.), Abe Myers, Tyler Ronk (Sr.) (Sr.), Sam Elliott (Jr.), Jackson Seiple (Sr.), Matt Priestas (Sr.), Andy VonHouten (Jr.), Max Lenz (So. ), Josh Hageman (Jr.); BUCKEYE VALLEY – Jack McKean, Grant Owens (Jr.), Lathan McGraw (So. ), Matt Pentacost (Jr.), Paul Staley (Jr.), Wyatt McGraw (Jr.); DELAWARE HAYES – Sam Lagando (Jr.), Todd Toney (Sr.), Braden Donges (Sr.), Blain McCormick (Sr.), Isaiah Moore (Sr.), Blake Eiland (Fr. ), Ryan Daughenbaugh (Sr.), Josiah Naegele (Sr.), Ben Conahan (So. ), Mason Davis (Jr.), Mekhi Smith (Jr.); OLENTANGY – Nick McCafferty (Jr.), Ziyan Sears (Sr.), Jake Takach (Jr.), Trey Simpson (Sr.), Jaden Konadu (Jr.); OLENTANGY LIBERTY – Nick Paolo (Jr.), Grant Wilson (Jr.), Jacob Sincek (Jr.), Domininic Nappi (Sr.), Matthew Rohl (Jr.), Lucas Campbell (Sr.); OLENTANGY ORANGE – Jack Applegate (Sr.), Luke Schmeling (Sr.), Zane Fisher (Sr.), Jayden Rodgers (Sr.), Garrett Runyon (Sr.), Joel Sarpong (Sr.), Jimmy Sensibaugh (Sr.), Mark Roberts (Jr.), Brant Kightlinger (Jr.), Jack Houston (Sr.).